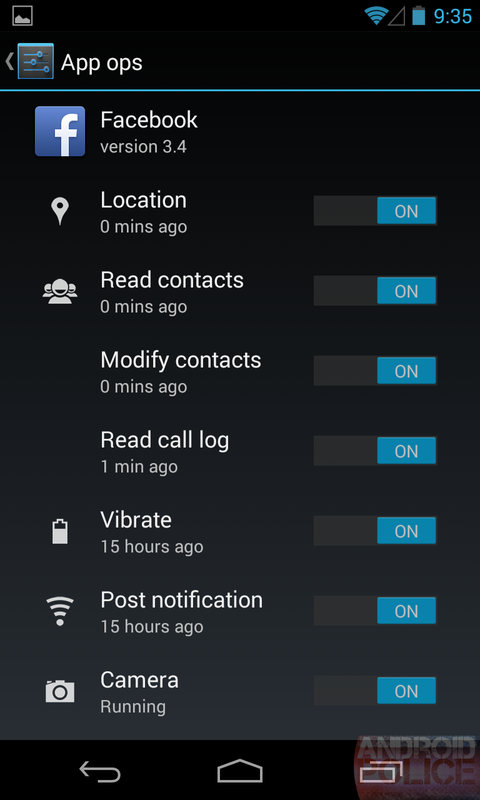 I always wondered, why the app manager or security manager did not let you change those permissions after installation as well? It works like this: in order to do something privileged like placing a call, reading contacts, accessing the internet, ... anything outside the "sandbox" of the app, the app has to declare this in the manifest that comes with the app. If it is not declared, it is not granted, and the activity (e.g. reading contacts) will fail. 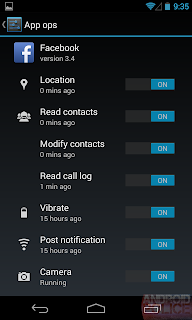 Now, with Android 4.3 it seems there is a tool to change those permissions during the life cycle for the app - see screenshot. See also here on Android Police or here on TechCrunch. One caveat, though: I'm afraid that most app developers are lazy and rely on the old model. That assume that the app will have the permission(s) simply because it asked for it during installation, so they will on catch the fact/error that the permission has been revoked, and simply crash. Crap, crap, crap. After only one year. This has been out for about 2 weeks already, but - optimist as I am - I wanted to wait for HTC to backpedal on this. "We can confirm that the HTC One S will not receive further Android OS updates and will remain on the current version of Android and HTC Sense. We realize this news will be met with disappointment by some, but our customers should feel confident that we have designed the HTC One S to be optimized with our amazing camera and audio experiences." 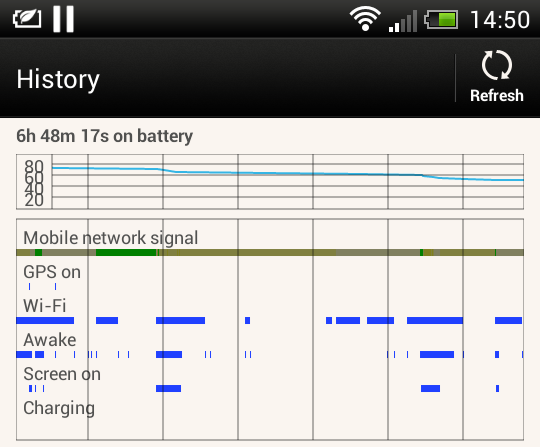 Earlier this week I noticed that the battery on my HTC One S drained really fast. 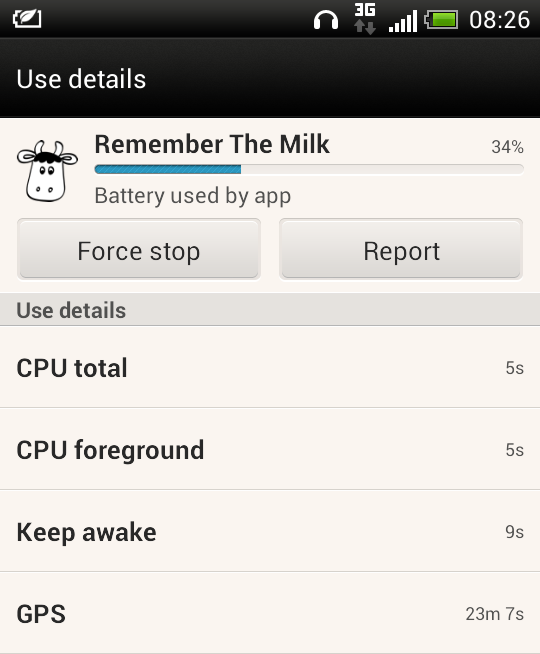 I check some settings and stats and found that the Remember the Milk app (RTM) seems to be the culprit. however, RTM was using GPS all the time, as can be seen in the details. And I could not make this go away. So I posted a question to the RTM support forum and disabled the app for the time being. I - totally dependent on RTM - disabled the app on my phone. Imagine that. 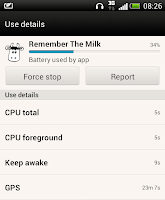 re-install RTM app from the play store. I did as requested, and voilà the problem was gone. RTM does not even show up any longer in the power statistic. (So nowhere near 34%). 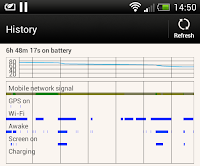 And GPS is really only on when I need it (see history).